This pillow adds a beautiful classic accent to my Charlotte comforter set. It is very well made of good soft quality material with a beautiful design and texture..........A definite compliment to the Charlotte bedding collection. 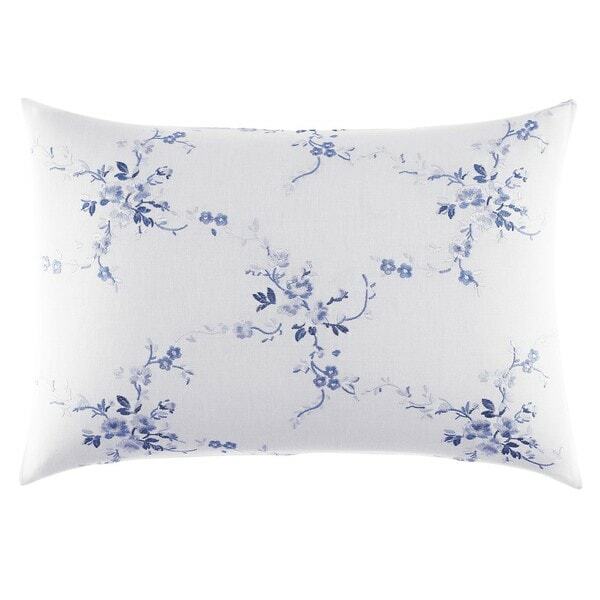 Let your bed bloom with this Laura Ashley Charlotte China blue embroidered throw pillow. Beautiful flowers fill the face of the pillow bringing an elegant feel to your bedroom. Pair with the coordinating Laura Ashley Charlotte Comforter (sold separately) to further elevate your bedding ensemble. love the look of this pillow as the finishing touch to the Laura Ashley Charlotte Blue and White Floral Cotton 4-Piece Comforter Set (just wish it had been included in the set!). The Laura Ashley Charlotte collection was *** at local department store. I did not want all the pillows, just this one. Got whole set and one pillow for half the price. Great deal. Beautiful pillow. This matches the Laura Ashley comforter set. Quietly delicate and elegant. Stunning actually! The white is a crisp, even, pure white. The material is so soft to the touch. The embroidery is exceptional. The detailing is impeccable. I look VERY closely at my purchases and this is a 10! My friends ooh and aah over it. The comforter set I purchased only came with two decorator pillows and I wanted a third to complete the look. It is a little larger than I expected but fit in very nicely. The embroidery work is beautiful. I am so pleased with this purchase. I have loved this pillow. Color and fabric is great! Love this Embroidered Breakfast Pillow! Absolutley love this pillow for my bedroom .. I bought two others and they blend and compliment each other perfectly. Of course my blue and white black out curtains also came from Overstock. I was so pleasantly surprised at the top quality fabric and construction. Gorgeous. I bought the whole set and have received so many compliments. "Are the breakfast pillows come with the inserts?" It's very beautiful and will compliment the bedspread we ordered.